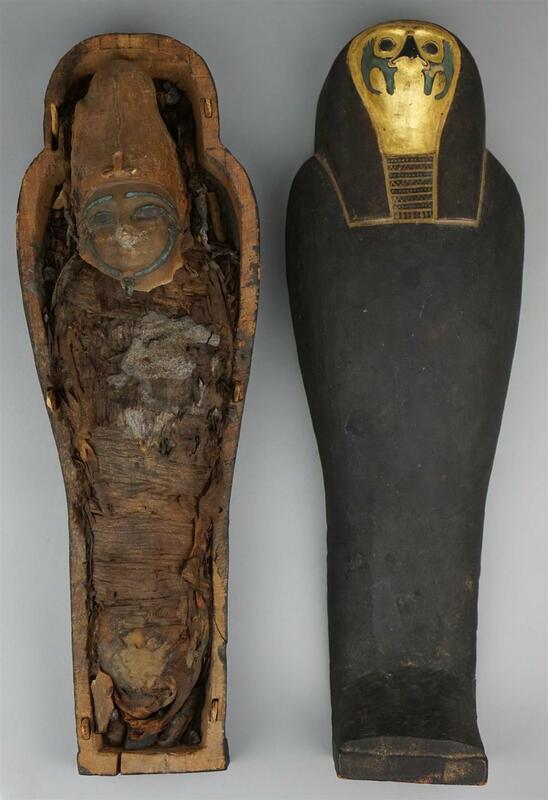 ALEXANDRIA, VA. — An Egyptian corn mummy was the top lot of Potomack Company's February 2 sale, as it sold for $112,500, including buyer's premium. The example had been acquired from Egypt in the 1940s and was exhibited at the Walters Museum of Art from 2004 to 2018. The mummy was filled with mud, seeds and grain enveloped in linen bandages and covered in a wooden black and gilded falcon-headed coffin. The coffin measured 19½ inches tall. As the catalog notes, "instead of actual human remains, ancient Egyptians moistened the seeds in a ritual ceremony in the belief that they would germinate and provide eternal life for the deceased." Although a mummy without human remains is often thought of as counterfeit, corn mummies were products of the period for specific ritual activities. The present example dates to the Late Period, circa 380 BCE to 395 CE. A full review will appear in a future issue.